Besides looking a bit more 'race car' what value does an AMG low profile trunk spoiler provide? Will it contribute to down force for an increase in traction (not likely - even at track speeds)? Will it lessen the amount of dust that collects on the back of the car (that would be a big plus)? Does it help reduce aero drag and perhaps increase fuel efficiency? Matters little, I'm going to order one anyway because I like how it looks when mounted on a black R230. I started this thread because I was curious if looking attractive was its only design feature. Any comments? I agree that the car looks much better with the spoiler out back. I even added one to my E350 diesel! Does it affect downforce? A little bit, but not enough to say you gotta have it. Help with dust? Nope, still dirty out back. Help with fuel? No. Anything with drag hurts rather than helps. Adding 1 PSI to your tires will do more to help. Bottom line, it looks good, makes me happy, done deal. '11 E350 Bluetec P2 Sport 55K Mi. 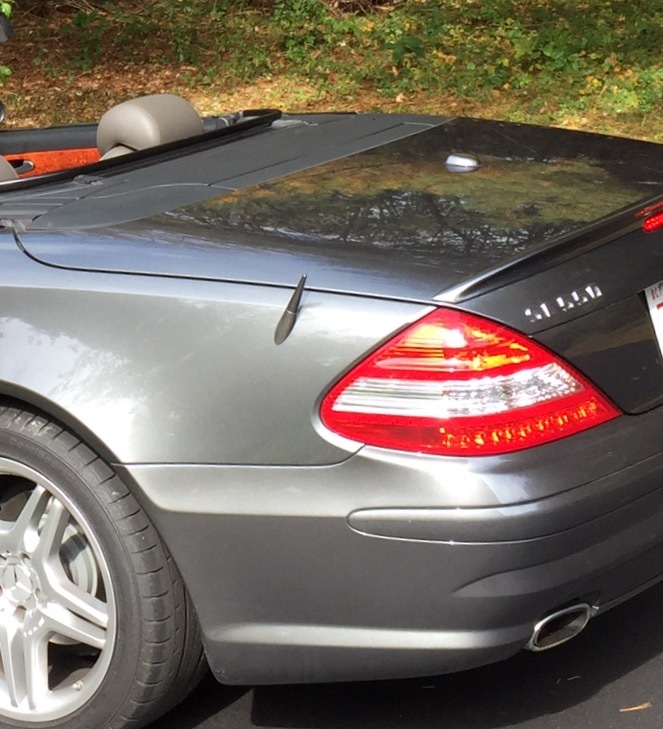 '03 SL55 AMG Pano 95K Mi. Share the pictures when you put it on. Looks great. Now imagine before picture, it feels like something missing, in my opinion this should have come with the original car. I'm convinced. Ordering one now for the 65! 5 Attachment(s) 560SL new owner - help!